In my 2010 book, What's the Big Idea?, I took a look at some of the most important and influential inventions in the history of the world - from the point of view of kids. What was more important - TV, or clocks? Cars, or toilet paper? 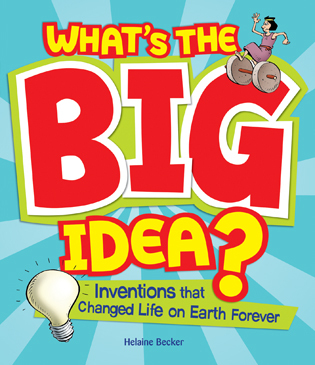 Many of the key inventions we rely on today had roots in earlier inventions (like the clock). We take those early items for granted, but without them, we wouldn't have many others. For example, that clock is at the heart of many of our best-loved tools and toys: televisions and computers, airplanes and cars, bicycles and (ahem) school. That's why I was so thrilled to learn that the Royal Ontario Museum is hosting a new exhibit, Mesopotamia: Inventing Our World. More than 170 artifacts, most never before seen in Canada, will be on display. I'll be going ASAP. If you go, let me know what you think! In the past few days, I’ve had five separate close encounters with turtles—three painteds, a Blanding’s, and a snapper. Why? Because it’s turtle-nesting season and I was helping females get safely across the road so they could lay their eggs. 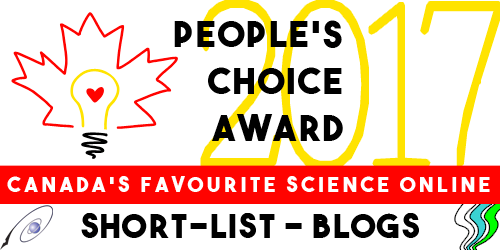 It's nice to do my part even if they sometimes make my hands smell funky. My favorites are common snapping turtles (Chelydra serpentina). They’ve been around for 40 million years and they look it. They’re very long lived—and long-necked!—and old ones can weigh as much as a ten-year-old child. In their wetland homes, they act like reptilian garburators, scavenging dead fish and other animals while carving out underwater routes for smaller reptiles, fish and amphibians. Because the snapping turtle’s lower shell, or plastron, is small, it can’t just hunker down and tuck in its head and legs the way other turtles do when threatened. Instead, snappers have developed an aggressive temperament and can be downright ornery. They have powerful claws and a sharp bony beak that—you guessed it—snaps shut, though not hard enough to take off a finger. Like all turtles, snappers lay their eggs on land and sometimes have to walk substantial distances to find suitable nesting spots. Unfortunately, this means they often have to cross roads that are near waterways. Though snapping turtles are well armed against predators, their hard shells and sharp claws are no match for the wheels of fast-moving cars and trucks. 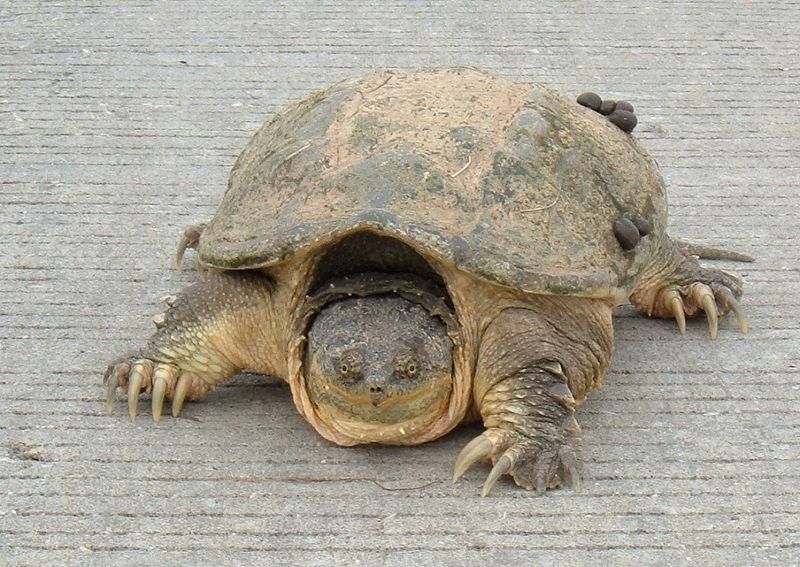 But even without the dangers of crossing roads, snapping turtles don't have it easy. They face heavy egg predation from animals such as raccoons, skunks and foxes, who can easily smell out freshly buried eggs and dig them up. And even when a nest is overlooked and the eggs hatch, young snappers still face so many dangers that the chances of surviving long enough to reproduce are incredibly slim, so slim it’s been estimated that only about one in 1,500 eggs laid will produce a turtle that reaches sexual maturity. Along with natural stressors, road mortality and severe habitat loss (southern Ontario has lost about 70% of its original wetlands to development), snapping turtles have yet another problem to contend with—hunting. 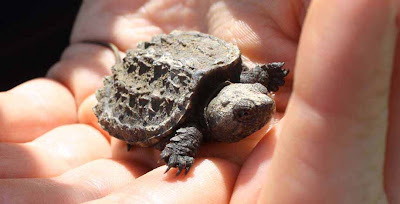 Anyone with a valid recreational fishing license is permitted to "harvest" up to two snapping turtles a day in Ontario, with a possession limit of five. Considering that snapping turtles have been listed under Ontario’s Endangered Species Act as a species of special concern because of the aforementioned stressors, the continuation of this hunt seems unconscionable. Pull over to a safe spot before getting out of your car. If it's any species other than a snapping turtle, use two hands to carry it in the direction it was travelling. Turtles often urinate when picked up. Don’t let this startle you or you might drop it! NEVER pick a turtle up by its tail—you could damage its spinal cord. Snapping turtles have long necks that can easily stretch half the length of their carapace and they can also inflict a nasty bite or gouge you with their claws, so it's best not to pick them up. Instead, try using a stick or a shovel to coax them across the road. A snapping turtle will also sometimes latch onto a stick held near its mouth, making it easy to drag it across the road. If you know the location of a new turtle nest, you can lightly sweep the surface to remove the scent or cover it with a board for a few days. You can also protect a nest from predators with a piece of wire mesh (at least 2’x2’) stapled onto a wooden frame or held down with rocks. Remove the mesh protection after 14 days. 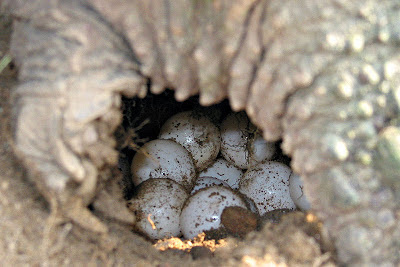 DO NOT disturb the eggs in a nest. For five days in May, I woke every morning to a view of the Irish Sea, as it shushed in and out on its regular tides. My daughter and I stayed in Benllech, in Anglesey, Wales (UK). Since we live on the Saskatchewan prairie, right in the middle of Canada, it was a treat to find ourselves in a place where the mountains touch the seashore. Our apartment was only a 10-minute walk from the beachfront. It didn't take us long to begin exploring this new habitat. On our first day, we pulled off our shoes and socks and walked on the yellow sand. It was a sunny day, with mild temperatures rising to about 12°C. 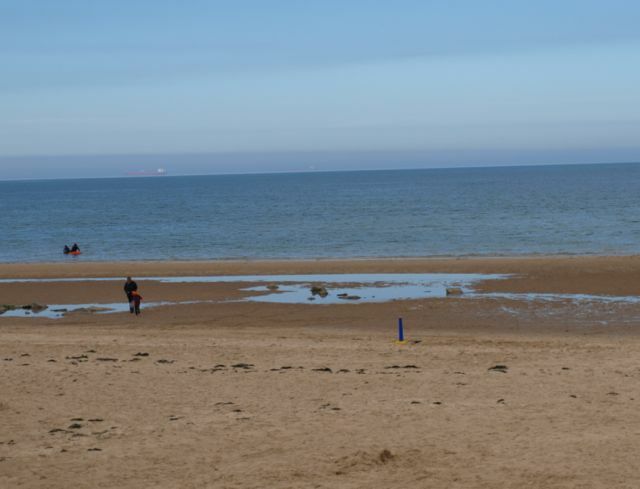 Benllech retained its Blue Flag status this year, which is a voluntary ecological label used in more than 48 countries around the world. It means that a beach follows a strict set of criteria including water quality, environmental management, safety, and services. 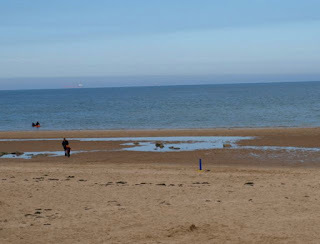 In April, the Daily Post had called Benllech one of the 10 best beaches in North Wales. When we waded on the seashore, the water felt warm and inviting. We noticed no one was actually swimming, though, which surprised us. We still needed our sweaters, even on this warm afternoon, and we noticed some people exploring in jackets. Farther out on the water, people were enjoying water sports in wet suits. Canoeing, water surfing, and water skiing seemed popular. 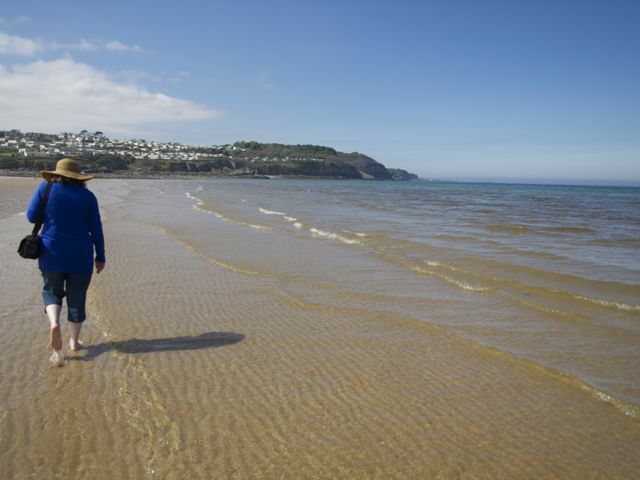 The water temperature in this part of the Red Wharf Bay averages 10°C (50°F), according to Surf Forecast. It's warmest in August (14-17°C) and coldest in February (5-9°C). Wetsuits are recommended. Luckily, we waded in late afternoon, when the sun had been warming the shoreline for several hours. Generally, the sea takes longer to heat up than the sand, because the specific heat capacity of water is greater. This was the warmest dip in the sea my toes had ever enjoyed. 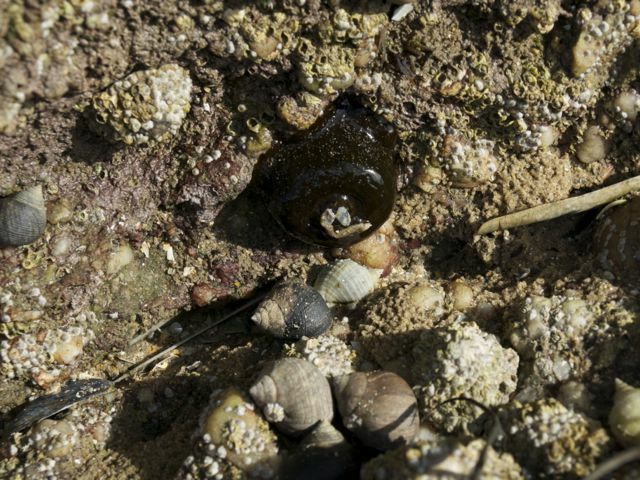 We shared the shore with a number of other creatures as well. 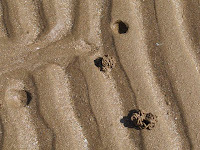 For example, these strange tracks dotted one section of the sand. 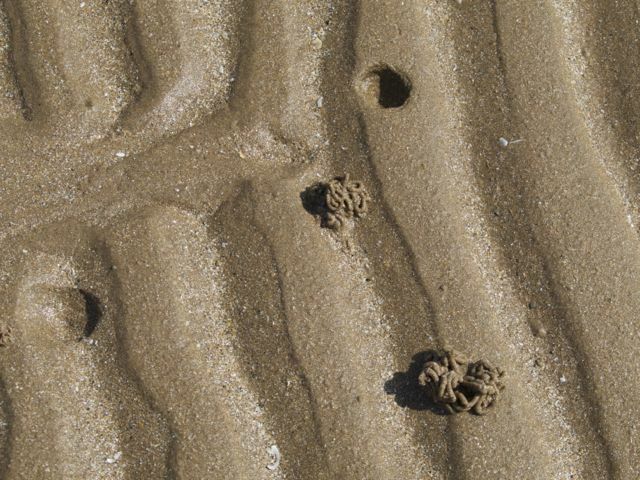 My daughter knew what they were, but I'd never seen lugworm casts before. These marine worms are popular bait for fishing, but we didn't see any of the actual worms or anyone digging for them while we were there. 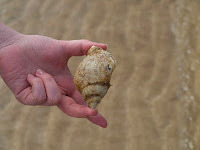 We found treasures like this seashell all along the beach. Although broken shell and even small shards on the sand showed where seagulls and other seabirds had dined, many of the shells were intact. This shoreline follows a section of the Anglesey Coastal Path starting at the nearby harbour village of Moelfre. The Coastal Path is a well-known walk, and this section leads along a hedged path near limestone cliffs, through wooded areas, and over boardwalks that provide many interesting views. But we preferred the leisurely walk along the shoreline, exploring as we went. 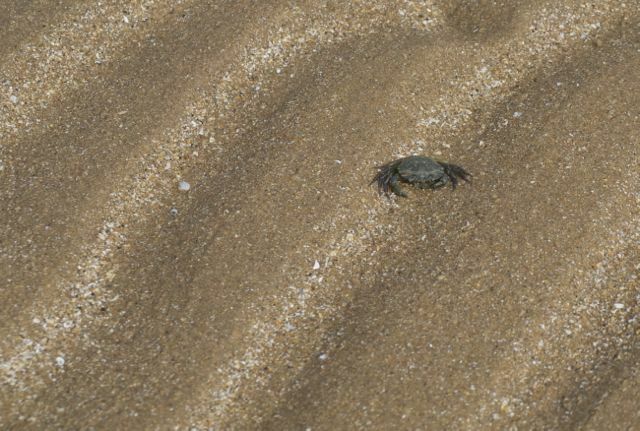 We saw several small crabs in the water and on land. This fellow seemed to have somewhere to go, so we left him undisturbed. We explored the tidal pools that formed along the way as well, and were often amazed at the conglomerates we discovered. Here, for example, we found a variety of intact seashells and interesting rocks embedded in the rocky material jutting out in a line from the shore into the sea. Our days at the beach proved all too short. Although we enjoyed exploring, there was so much left to see and do when our visit came to an end. Marie Powell is a professional writer, and the author of Dragonflies are Amazing (Scholastic). Her six-book series of beginner readers will be published this fall. 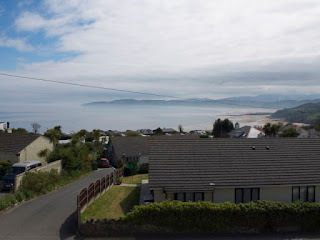 She stayed at 7 Llys Rhostrefor, Benllech, as a guest of Visit Wales.